Naked cake with meringue, sponge cake layered with meringue, cream, custard and berries. Creamy, sweet, berry tart, moist and a bit of crunch, all the elements i like in a dessert. Naked cakes have become very popular to make, they are rustic and yet delicate to look at. I entered a cream cake competition with this cake. I wanted to make merveilleux cake, but one of the criteria said that it had to have a cake base made of some kind of grain. Merveileux was then out of the question, I decided to layer sponge cake and meringue with cream, custard and berries. Beat the eggs until very fluffy and pale yellow (about 6-8 minutes on-medium/high speed). To test that it has been beaten enough, let some of the mixture drip into the bowl and write “Good” if you can see the whole word before it disappears it is ready. Pour the batter into the prepared pan. Smooth the top with a spatula to even out the surface. Pour the pipe into the mold and sprinkle easily back and forth with the licking pot so that the surface becomes even. Bake the cake at the bottom of the oven for about 40 minutes until the sponge cake has risen and nicely golden. When you inset a toothpick into the center it should come out clean and dry. Leave the cake in the pan for a few minutes before you remove it. Place it on a rack to cool and cover it with a clean tea towel. Combine egg whites and sugar in the heatproof bowl place it over a pan of simmering water. Whisk constantly by hand until mixture is warm to the touch and sugar has dissolved, the mixture should feel completely smooth when rubbed between your fingertips. Take the bowl off the heat and whisk with a handmixer. Starting on low and gradually increasing to medium-high speed, whisk until stiff peaks form. Continue mixing until the mixture is fluffy and glossy. 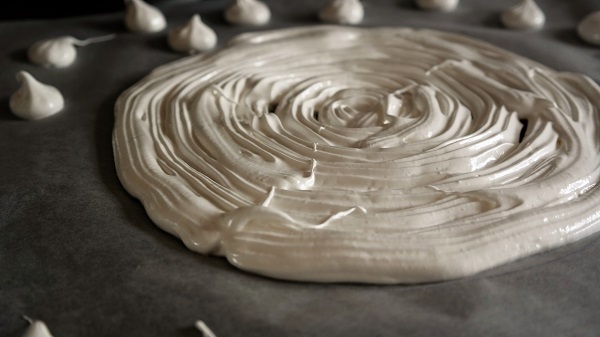 Fill a piping bag with the meringue and pipe two discs on a baking tray lined with baking paper. Use two trays if you can’t fit two discs on one. The discs should be a little smaller in diameter than the sponge cake. Pipe little kisses or drops with the remaining meringue to make decoration. Place the tray in the middle of the oven and reduce the heat to 100 C. The disc is ready when you can pick them up easily about 2 hours. The smaller kisses takes 40-50 minutes. Build your cake las in the picture above. Spread blueberry jam on the bottom layer then cover it with cream. Place the meringue disc on top of the cream, then add the custard and top with berries. Spread raspberry jam on the bottom of the middle layer and place it over the berries jam side facing down. Repeat the steps and spread raspberry jam on the bottom of the lat layer. Cover the cake with cream and decorate it.